The North Face produces a whole range of different outdoor gear but their apparel line is easily what they’re best known for. The TNF emblem on the chest of jackets and fleeces is easily recognizable and the brand remains a trusted source of winter clothing for casual use as well as sportswear. Finding winter outerwear that is appropriate for sports or physical activity is difficult. Normal parka-style winter jackets made for casual wear are often too thick and restrictive. Thinner jackets may make movement easier but aren’t often warm enough to wear without layering, which leaves you feeling restricted yet again. Skiers often have a trickier time with jackets as this activity requires you to have unencumbered movement in the legs, core and the arms. Thankfully TNF has a few different jackets that are ideal for skiing and similar winter sport activities. Here are the top 3 skiing jackets produced by The North Face. Sometimes one jacket just isn’t enough for frigid cold ski trips. Layering up is a must but finding the right combination of a jacket and parka that will keep you warm without being too bulky is tricky. The North Face solved this issue by creating their Thermoball Snow Triclimate 3-in-1 Parka. This 3-in-1 outerwear set features a Thermoball liner jacket with PrimaLoft technology for maximum warmth. The Thermoball Snow is completely waterproof, and even has sealed seams to ensure you’re going to stay dry in even the wettest snow. Both the liner and shell are surprisingly breathable, keeping you comfortable under a warm winter sun or while sweating from a strenuous ski adventure. Underarm vents help keep sweating and overheating at bay. Being a parka, the Thermoball Snow is loaded with pockets. This is ideal for cross country or adventure skiing in the backwoods as you’ll be able to carry important gear right on you. There is a normal zippered check pocket and handwarmer pockets complete with a super soft liner. There are additional double hip flap pockets. Inside the jacket you’ll find an internal media pocket to protect electronics like your mobile phone and two other internal mesh pockets. There is also a specific goggle pocket so you don’t accidentally lose or scratch your goggles. The zip-in style of this parka makes it compatible with other TNF liner jackets, if you decide you don’t want to use the Thermoball liner. This 3-in-1 parka is priced at $349 (check this listing for the latest live prices), which is acceptable for the versatility, durability, and warmth this model offers. For those warmer, casual ski trips the Bombay jacket is an excellent choice. The North Face created this jacket as a midlayer for very cold weather but it works perfectly on it’s own as well. This jacket doesn’t have a super high loft, but it plenty soft and compressible. It’s insulated with Heatseeker, which a synthetic insulation created by TNF with the main purpose of trapping warmth. 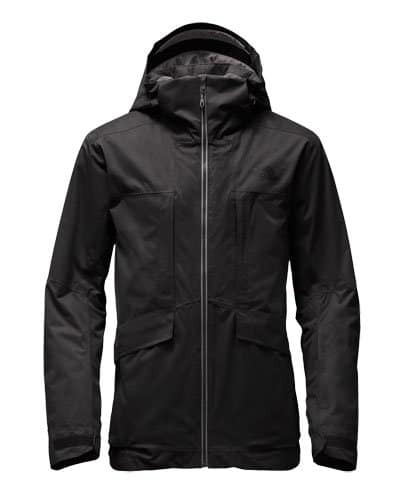 This jacket has great water-resistance and will keep you dry if you happen to tumble in the snow. You can easily layer a light fleece under the Bombayor wear it under a hardshell jacket for those very cold winter days. This jacket looks great and isn’t so bulky that it’s troublesome to wear while working outside on your gear, setting up camp or just wearing casually around town during an errand run. Essentially it’s a pretty basic jacket, and only has the necessary features the average skier needs. The Bombay retails just $99 (check this listing for the latest live prices), which is a real steal of a price. This model looks and works like a high-end technical ski jacket but without the price tag. 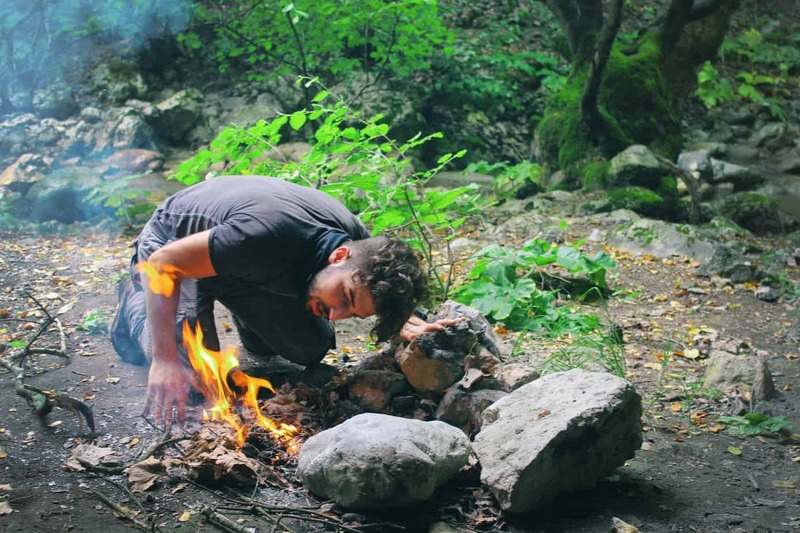 Since it can be easily used in layering, either over or under (or both), it really is a must-have workhouse piece for any outdoor enthusiast. If you need something more than the Bombay but don’t want to deal with the dual layered 3-in-1 Thermoball Snow, the Mendelson Jacket might be the right fit for you. This insulated ski parka has a ton of useful features that will allow you to spend the most time out on your favorite ski trails. It handles bitter cold and wet weather, making it a very popular choice for the serious TNF ski fan. Essentially the Mendelson offers everything the Thermoball Snow 3-in-1 does but without the removable layer. This is an advantage for those in very cold climates as you’ll be able to get even more warmth since you’ll be able to easily add a midlayer to this parka without it getting too bulky. This jacket is not really for casual use or for warmer winter day, but most appreciated by the serious skier or outdoor enthusiast that is having trouble staying warm. 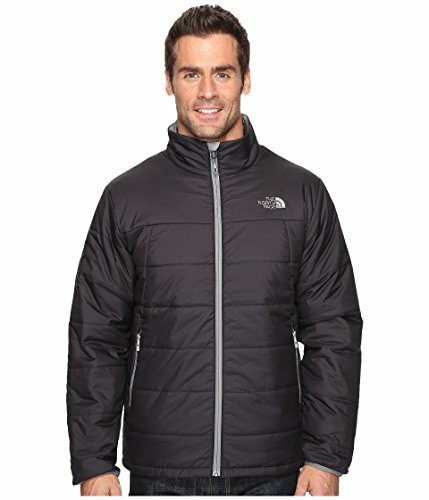 The Mendelson retails for $399 (check this listing for the latest live prices), similar to most TNF parkas. Spending nearly $400 on a jacket may seem like a lot but many customer find that this model is worth every penny of its high price tag. This parka has expedition-quality construction but toned down just a bit for the skier that doesn’t let frigid winter days stop them for heading outside. The North Face certainly makes some amazing jackets, and the models featured here are just 3 examples of the quality apparel the brand produces. Whether you’re new to skiing, have been a lifelong skier or just are an adventurer that does a little bit of everything and needs an athletic winter jacket, any of the above 3 would be perfect.